After the toucans and trogons bid us farewell, we left the majestic cloud forest and the mountains we have grown to love and headed to the Quito airport. 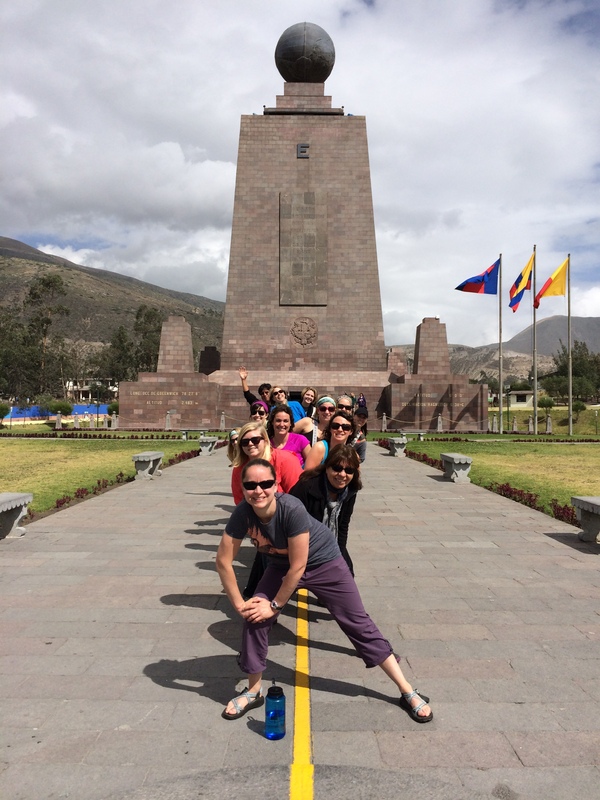 En route, we spent time at “Mitad del Mundo” (Middle of the World) – latitude 0°0’0” and, if we had said, “we were the center of the world,” we would have been correct. After documenting our fun jumping between hemispheres, we looked around at the shopping paradise awaiting us and then took full advantage of our ½ hour opportunity! 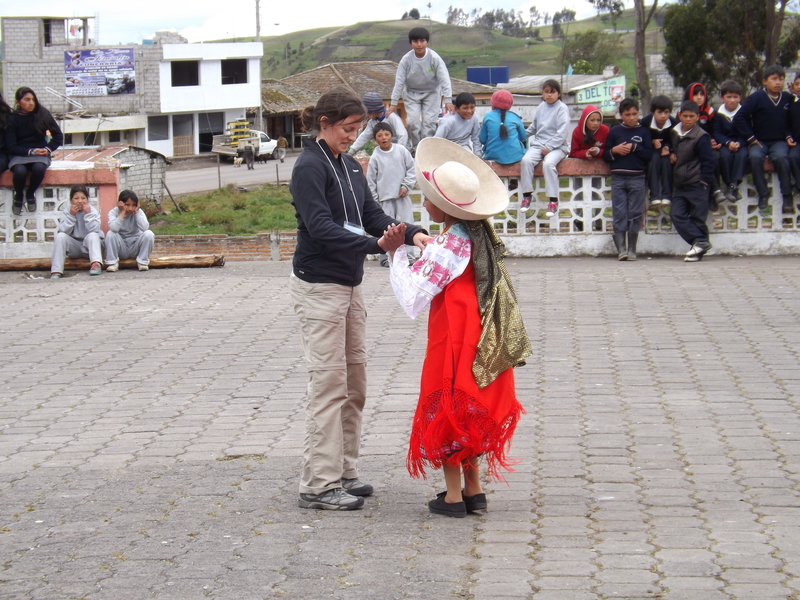 Our time passed all too quickly and we reluctantly piled on the bus with bags full of Ecuadorian treasures – tagua nut jewelry, scarves, bags, whistles, llama dolls, and more! We each had one foot in the northern hemisphere and one in the south. At the airport, we discovered we had internet access for the first time in two days and were thrilled to post Day 4 and to read comments from our friends and family back home in N.C. – it reminded us of receiving summer camp mail! After a short 45-minute flight, we landed in Guayaquil, where a two-hour bus ride delivered us to the Pacific coast. Though the ride was long, the company was great and we feel we’ve grown closer as a group, talking, laughing, and learning along the way. The long day’s travel from the mountains to the sea was certainly worth it when our bus delivered us to the town of Ballenita and a breathtaking oceanfront sunset. We were welcomed to our hotel with a beautiful sunset. We eagerly anticipate visiting a new Heifer site, an artisanal fishing project. We continue to be inspired by this selfless organization that empowers people and communities. After arriving at the Bella Vista reserve in the dark we knew we were somewhere beautiful but never imagined the majesty that the morning sunlight would unveil. In our treetop canopies we awoke to a picturesque view of mossy trees, clouds, and wildlife. We did not have to walk far from the lodge for our early morning bird watch to see a lot of activity. We admired toucans, hummingbirds, flycatchers, tanagers, and surrounded by a cacophony of sounds. After a short walk, we enjoyed a delicious breakfast that provided energy for a three-hour hike. 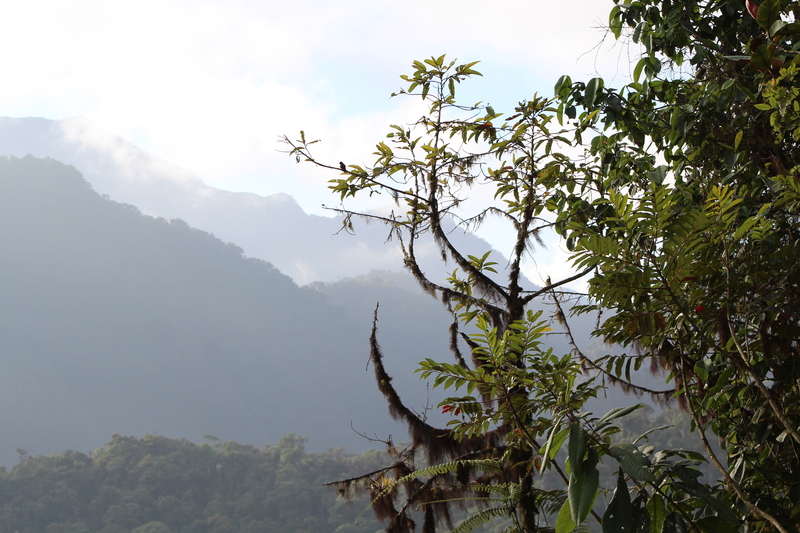 View of the cloud forest during our morning bird hike. One of several Plate-billed Mountain Toucans that was taking advantage of a tree next to the parking lot that produces fruit for two weeks each June. On the longer hike, our expert tour guide, David, led us through the cloud forest and shared a wealth of information about the flora and fauna we were seeing. 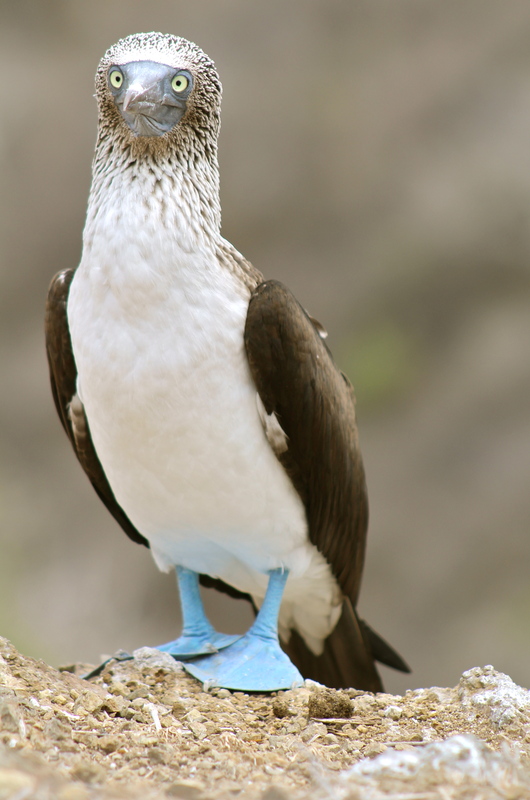 The forest contains a wide variety of birds and butterflies, and the rarely seen olinguito, spectacled bear, and snakes. David explained that a flower’s colors indicate what pollinators are attracted to it. For example, yellow and white flowers will attract insects while red flowers attract hummingbirds. 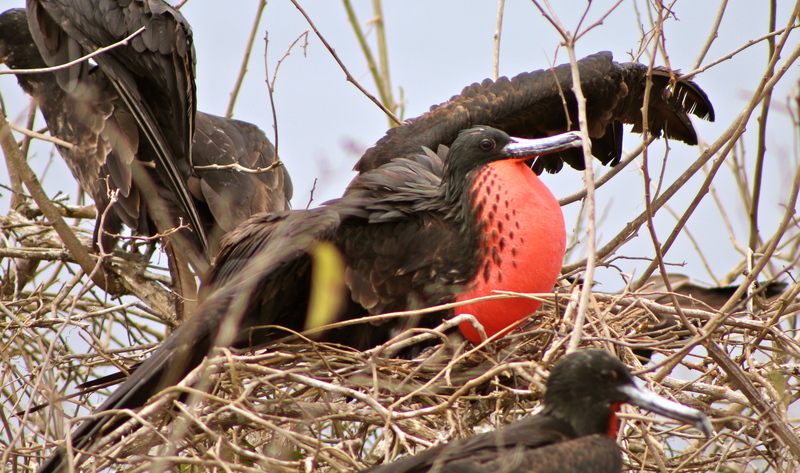 Pink, purple, and orange flowers attract birds while bats pollinate dark, smelly flowers. If a flower is a mixture of colors, it will attract multiple pollinators. We also learned about the difference between a rainforest and a cloud forest. A cloud forest sits at a higher elevation and the ground receives more sunlight due to openings in the canopy. We could write a book using the plethora of information we acquired and the connections we made to the flora and fauna of North Carolina. After viewing a minute portion of the 4,070 types of orchids, 2,627 butterfly species, and 131 hummingbird species here, it’s undeniable that Ecuador has the greatest biodiversity in the world. 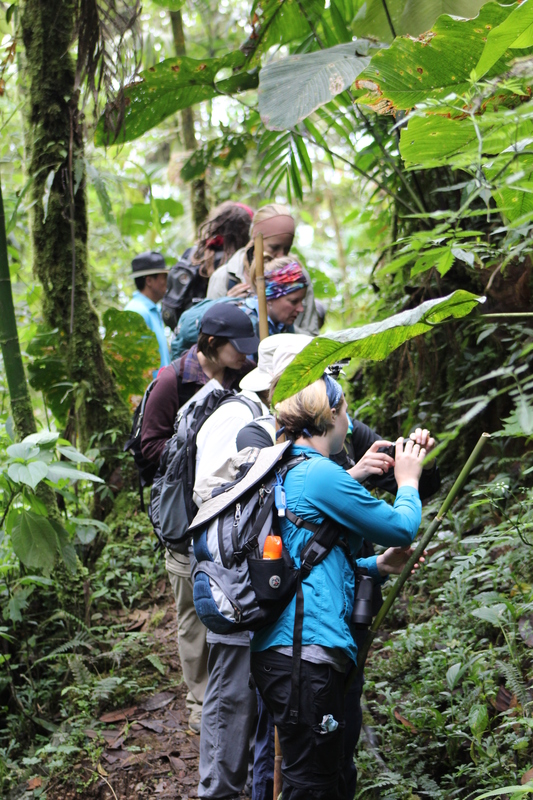 Stopping to examine the plants along a trail in the cloud forest. Although we didn’t want the hike to end, our stomachs were happy that lunch was ready. We found it incredible that even in the middle of the cloud forest, the chefs prepared a meal for us with the freshest and tastiest ingredients. As we ate lunch the clouds rolled in and we had our daily debriefing. We discussed how appreciative we were for this Institute and for the people we are sharing it with. We even got choked up recapping our experiences and reflecting on our new friendships. Finally, we finished out the day surrounded by hummingbirds, watching the US battle Portugal in the World Cup and enjoying a final visit with the olinguitos. Gooooaaal x3! We ate an early breakfast and packed up to head back to Communidad Cumbijín. 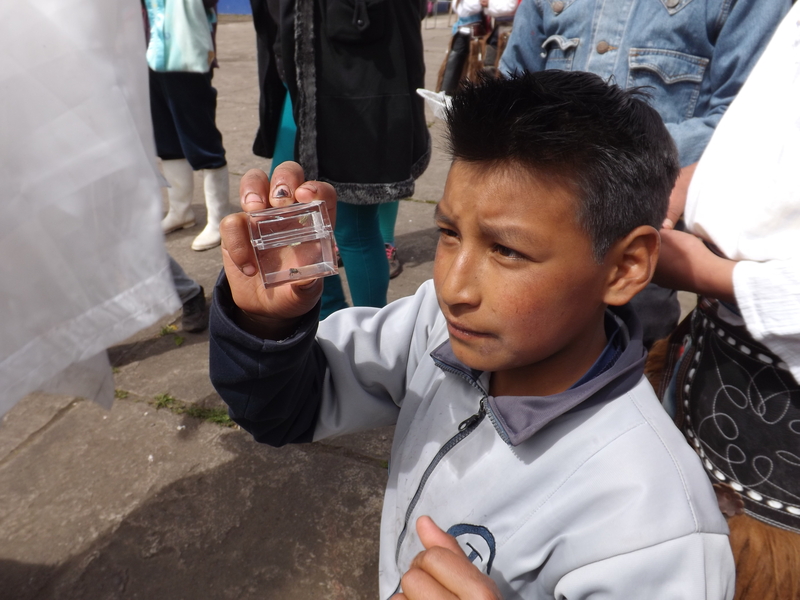 On the bus ride up to the community, we learned about the cultural significance of guinea pigs (cuy in Spanish) and how they are used in medicinal ways, which date back to pre-Columbian Incan tradition. We continued further up in altitude (13,255 ft) to the Parque National Llanganates, a community-protected area of the páramo. After a winding, uphill drive we opted to walk the scenic route to the Laguna Anteojos, two lakes that look like eyeglasses when viewed from above. 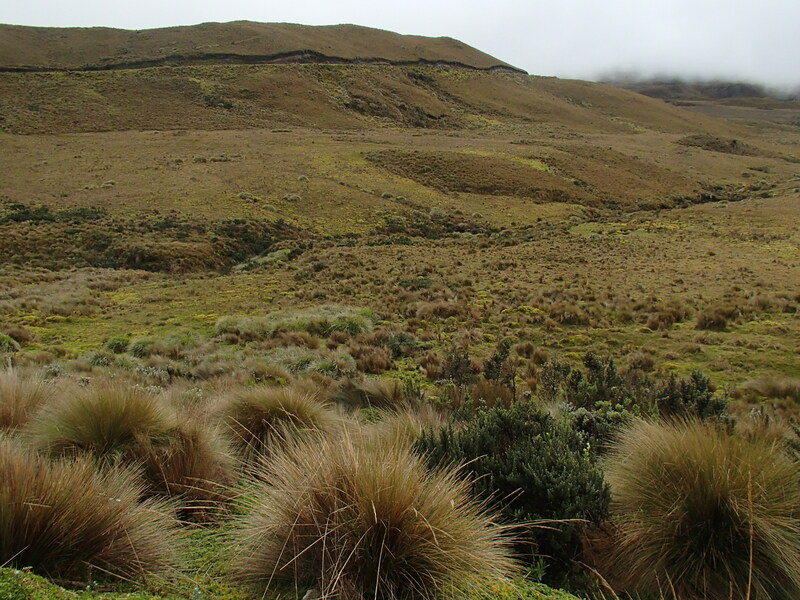 The vegetation in the páramo acts like a sponge to slowly release the large amounts of fresh water that flow down from the surrounding mountains. As we meandered up to the lakes, we had to remind ourselves to not just take in the panoramic view, but also to observe the microhabitats that consisted of a huge diversity of flowering plants, lichens, mosses, horsetails and grasses. Páramo scenery at Parque Nacional Llanganates (Llanganates National Park). We then loaded back onto the bus and drove to the site of the Cumbijín community’s alpaca project, which is supported by Heifer Ecuador. 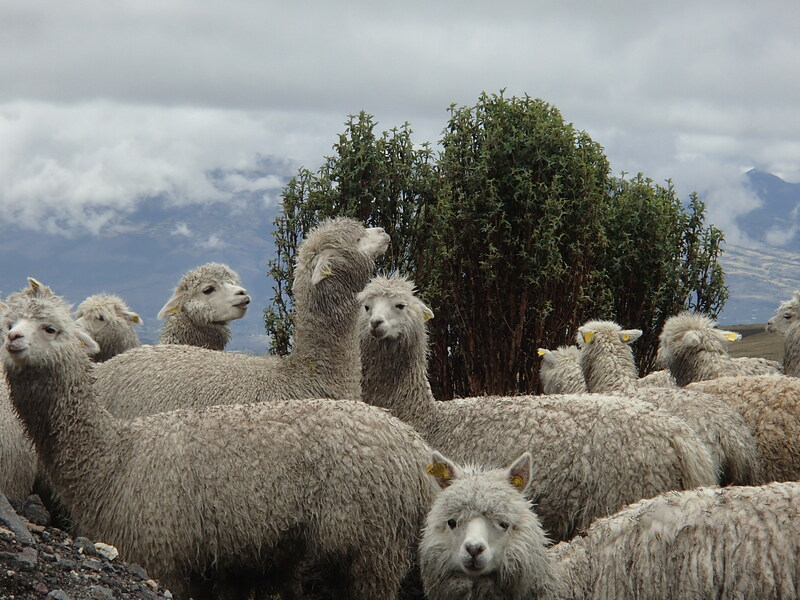 Once there, the project director introduced us to the community’s herd of 76 alpacas which were given to them two years ago by the Morochos community, a Heifer-supported project that previous Ecuador Culture and Ecology Institutes have visited. This illustrates one of Heifer International’s 12 Cornerstones of passing on the gift. The director of the alpacas debriefed us on their care regimen; which includes deparasitizing, clipping down nails, and filing teeth. Due to a wet climate, the vegetation is fairly tender, therefore the alpacas’ teeth were not worn down as they naturally would be by tougher vegetation. We anxiously awaited the alpacas’ arrival as they were herded up the road to meet us. Without a sound, they walked past us, evidence of how their padded toes don’t negatively impact the soft ground of the páramo. Cameras were flashing in an attempt to capture the quirky, yet adorable camelids. After about 30 minutes of watching the alpacas interact with each other and graze, it was time to let them return to their pasture. When the alpacas left, the park rangers invited us in out of the cold and shared with us Sunfo, a sweet, minty, warm tea made from a native plant that helps detoxify the body. Then we returned to the Cumbijín community for their annual festival. We feasted with the locals on typical Andean food — fava beans, cow cheese, chicken and cilantro soup, rice and beef, and a drink called chicha, a lightly fermented drink made from maize and spices. After lunch, we went to the community square to enjoy costumed dances to celebrate St. Andrew. 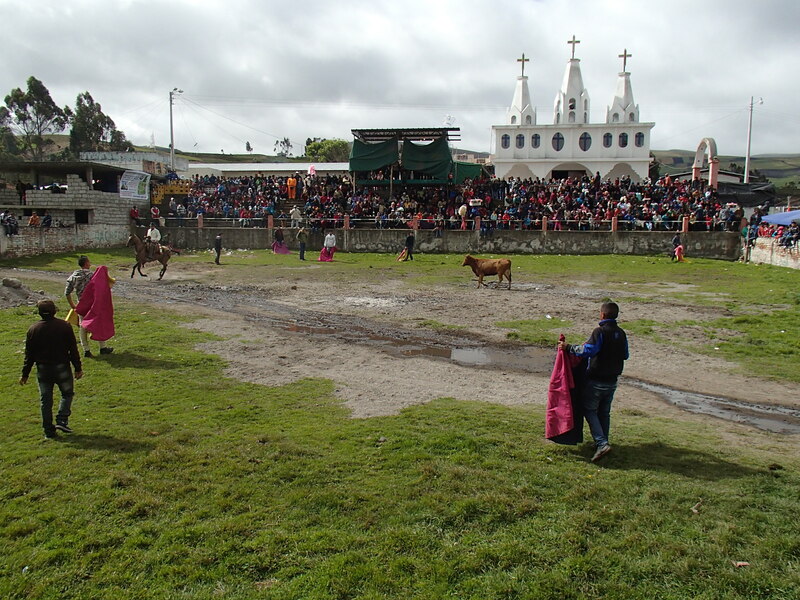 We were honored to be invited to watch another community tradition, Torros del Pueblo, a sport that includes horses, bulls and brave young men. Unlike in bullfighting, the bulls are not injured. The first bull was released in our honor and we enjoyed the spectacle. Torros del Pueblo, an annual event in the Cumbijín community. Once back on the bus, we drove north of the equator and headed up to the cloud forest. We reached our final destination, Bella Vista Cloud Forest Reserve, after traveling on a road that would keep out the faint of heart and tender of tush. 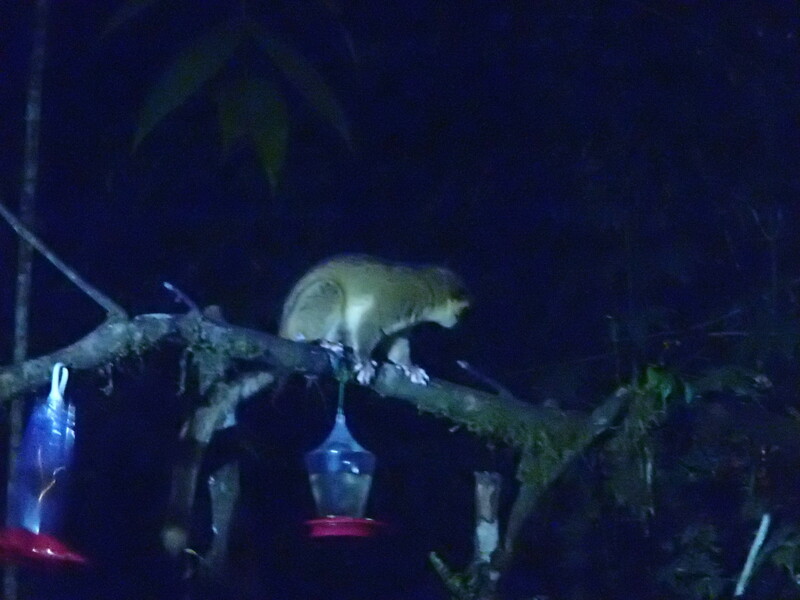 We checked into our Swiss Family Robinson-style accommodations and on our way to dinner, checked off team goal numero uno: to see the newly-described olinguito, a two-pound, omnivorous, raccoon-like mammal. (We were especially excited to see the olinguito because one of the Museum’s researchers, Dr. Roland Kays, was involved in the field verification of this mammal.) A few olinguitos started visiting the Reserve’s humming bird feeders a few months ago and have become fairly regular evening visitors. 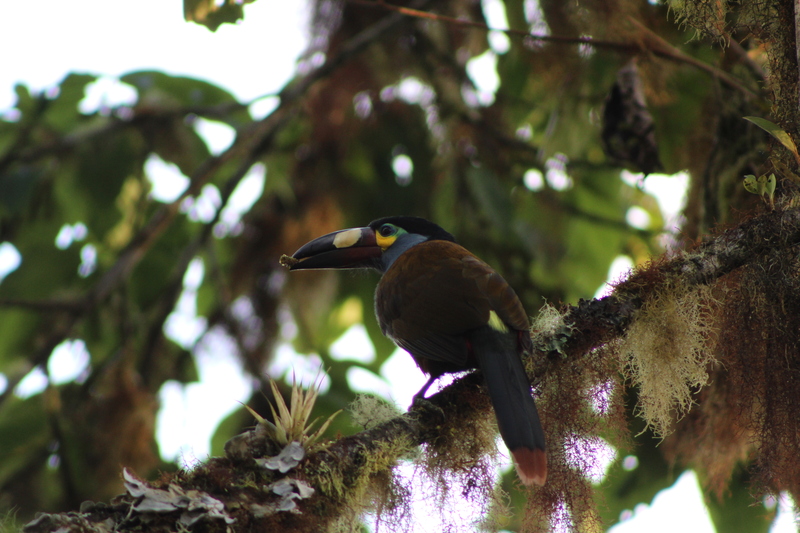 This sighting was the perfect welcome to the cloud forest and the beginning of our next eco-adventure. 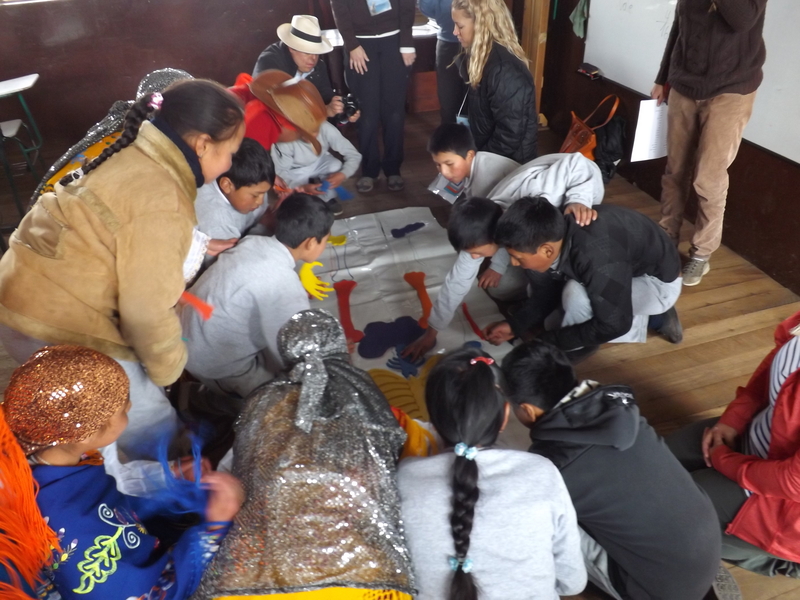 After a light breakfast, during which we tried two new juices, guava and tree tomato, we headed to the Community of Cumbijín, a mountainous páramo partner with Heifer Ecuador, to distribute the lessons, activities, and materials we had prepared. As we entered the school grounds, we were overcome with emotion as one student ran over to hug each of us! We immediately felt welcomed! The NC teachers divided into three teams, accompanied by a translator, to lead the professional development with the teachers and students of the 6th, 7th, and 8th grades. 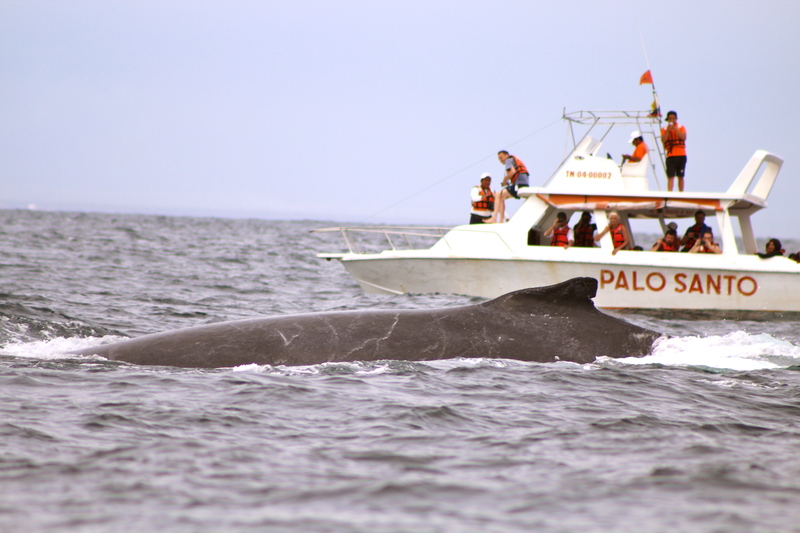 The three topics were Human Body, Wildlife of Ecuador, and Outdoor Investigations. We were excited to interact with the teachers and students and they were eager to learn and participate in the activities. We asked the students if they would be able to repeat the activities with the younger students and they yelled “¡Sí!” in unison! Ecuadorian student with bug in a box. Ecuadorian students assembling a model human skeleton. After many hugs and pictures, we gathered with the community and students in the town plaza where we were honored with a presentation of traditional Ecuadorian dances by the students. Then we were asked to dance with the students! 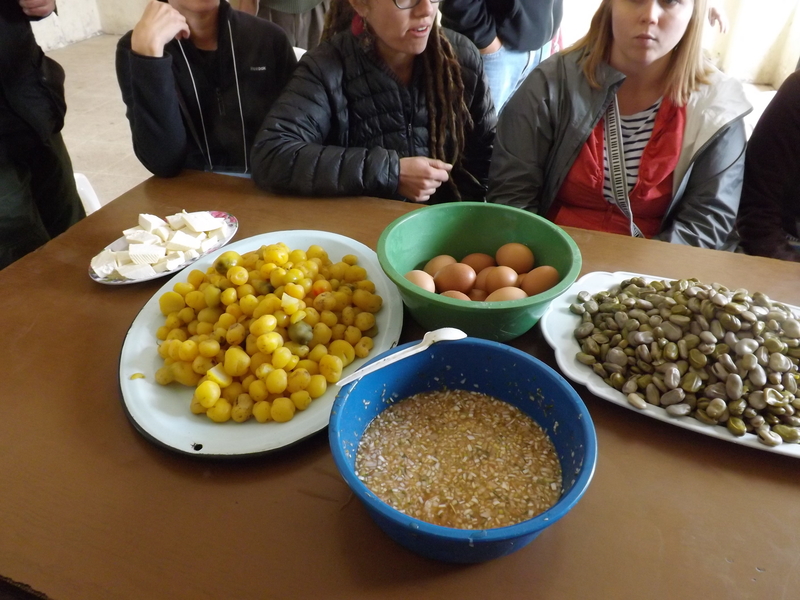 We said “adios” to the students and enjoyed a traditional Andean meal of melloco (a tuber similar to potatoes), fava beans, cheese, papa chaucho (potatoes), hard boiled eggs, and ají sauce (which is very similar to salsa). The meal was a “bamba mesa” which means “potluck” and was prepared by the students’ families and was produced within the community. After performing a dance traditional to the region, the students asked us to dance with them. 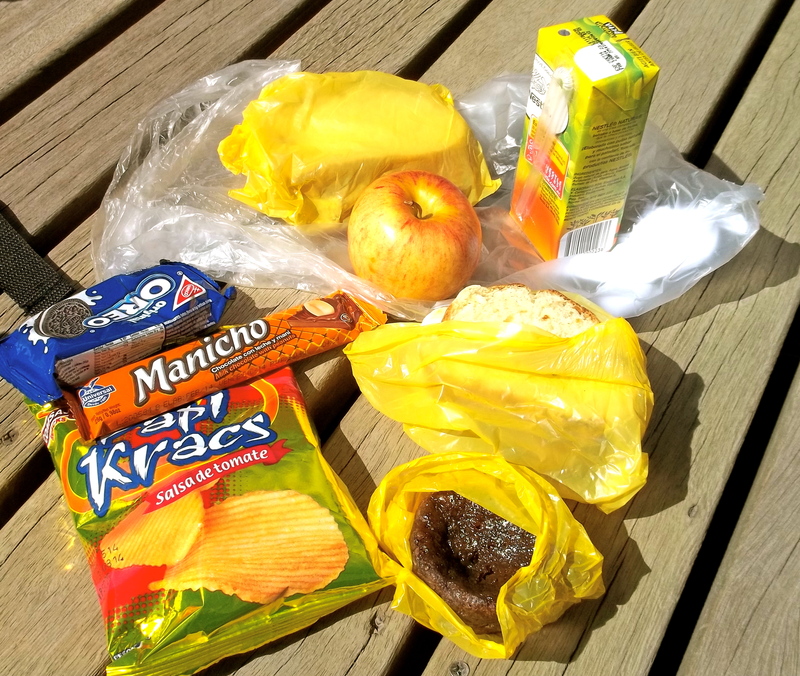 Our wonderful meal of typical Andean cuisine. In reflection of the day, we realized that though we are geographically far apart, we are similar in many customs. For example, the school was organized similarly (with a principal, classes by grade, a parent-teacher association, & a student council). More importantly, we met passionate teachers and enthusiastic students, which inspires us; all of our hearts grew a little more today! We started the day with a great breakfast at the Hotel Sebastian in Quito at an altitude of approximately 2,850 meters. Que delicioso! We got our shopping fix at the local Arte Folklore Olga Fish then took a short walk through the city to Heifer Ecuador Headquarters. After a warm welcome from the Heifer Ecuador team, we were engaged by a presentation by Rosa Rodriguez. She informed us about Heifer’s mission to promote sustainability through environment and development in five programs: Mangroves, Dry forests, Highlands, Páramo, and the Amazon forest. More than 13,000 families in need have benefited in 7 short years and will continue to do so through the value chain model. Within this model, Heifer assists the family, who then shares with the community, which develops the region to produce better conditions for everyone involved. Check out www.heifer-ecuador.org for more information about Heifer’s work. 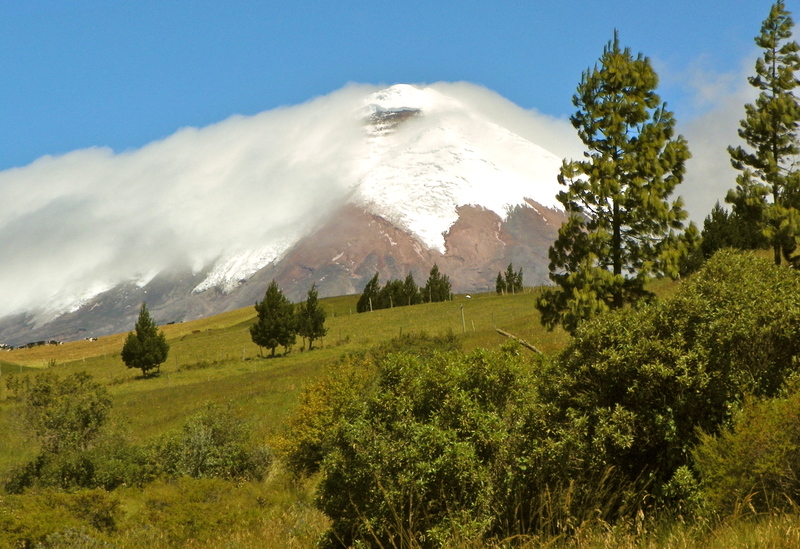 We then began traveling through the cities, valleys, and rural areas on our ascent to Cotopaxi National Park. The ride was beautiful and dizzying with the increased altitude but thankfully we had consumed Coca Tea to help us acclimate to the steep paths. At more than 12,000 feet some of the group were feeling the effects of high altitude. 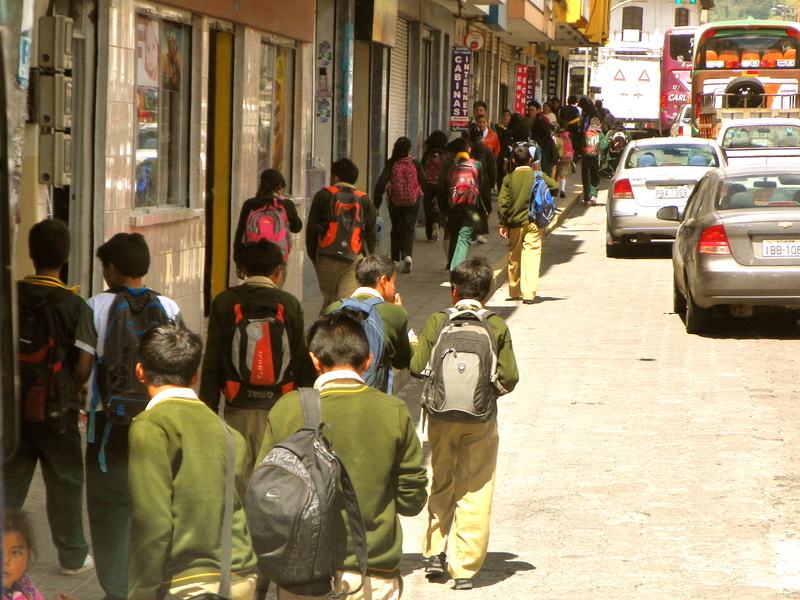 Ecuadorian children walking home from school. We rounded a corner and saw that the clouds had parted for us to see the magnificence of the summit of Cotopaxi. One of our leaders, Patricio, told us of a legend that says when the clouds part, the mountain is welcoming you, and it only happens to good people. The clouds part as Cotopaxi welcomes our group with a magnificent view. We continued up the mountainous road and witnessed the wild horses and grazing cattle just before we arrived at our lunch spot. We sat together in front of a looming volcano and a lake — how magnificent! Some of our group members presented topics about the Andean condor, calderas, and the Páramo. After our delicious lunch of guacamole sandwiches, mayonnaise potato chips, apples, chocolate muffins, and Oreos, we started our descent back down the mountain to the Hotel Villa de Tacunga in Latacunga. Delicious lunch prepared for us by Hacienda El Porvenir. 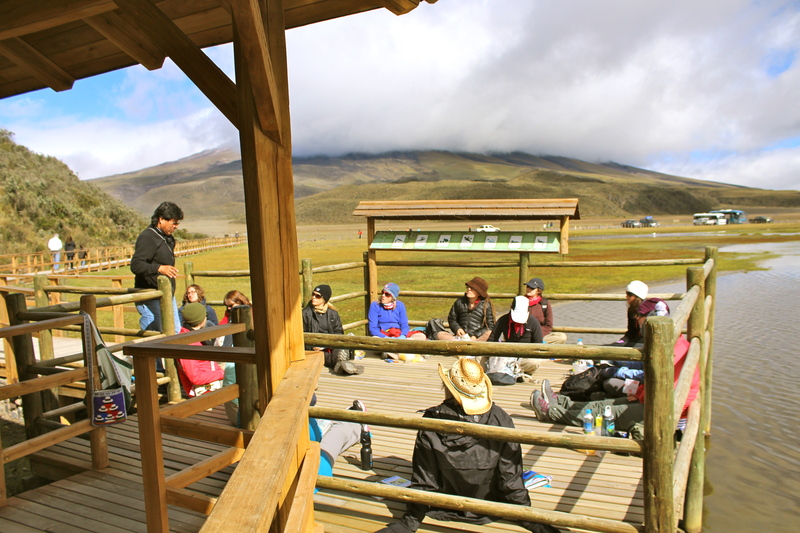 Our group enjoyed a picnic lunch on a wildlife viewing platform. 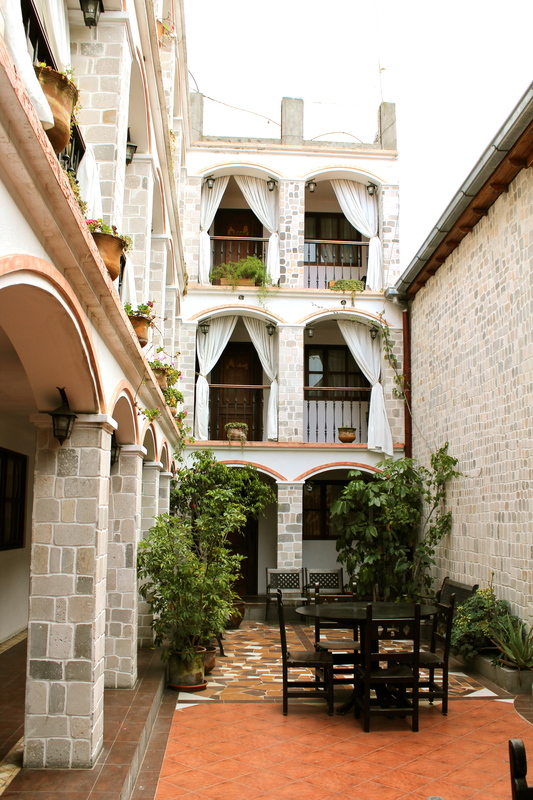 Our beautiful hotel in Latacunga, Ecuador. We are about to begin putting our teaching boxes together and enjoy the city! Hasta pronto!